Genres: 2 Classics, 1 Adult Thriller, 2 Adult Contemporaries, 2 MG Fantasy and 1 YA Paranormal. I started off the month by continuing with my Harry Potter re-read. This is the longest of all the books so it took me a little longer but I really enjoyed being lost in that world again for a while. I obviously loved it and gave it five stars, no complaints here. I'm starting to become aware that I've only got two books left in the series before I finish my re-read and that's making me a little sad. I think this re-read thing is going to have to be an annual occasion. I decided to pick this up because I wanted to read something quick before going away on holiday at the beginning of the month. This is another of Penguin's 80 Little Black Classics that cost just 80p each, I really want to grab a few more of these while they're still around. This one is a small selection of lesser known fairytales by Hans Christian Anderson. They were obviously all excellently written and compelling but I just found them so strange and they were much darker than I expected. I did find this really interesting as an insight into the real origin of fairytales, back when they contained warnings as well as morals and there wasn't always a happy ending. This is the story of four people who accidentally meet on a rooftop on New Years Eve, all separately planning to commit suicide. They make a pact not to kill themselves and the story follows them in the months after that fateful night. It wasn't as great as I was expecting, I think it was mainly because I don't really get on with Nick Hornby's writing too well, there's something about it that doesn't quite click with me. I did expect it to be more of a comment on mental health but it didn't really go into that too much, it was more about the characters' individual journeys and their clashing personalities. Each chapter is written from one of the four main characters' perspectives and as with most multi-POV books I found that I enjoyed one much more than the others and found myself wanting to know more about that character. I'm not 100% sure on my feelings about this one, I did enjoy it but wouldn't necessarily recommend it and I will be checking out the film to see how I feel about that. I won't say much about the plot as I think it's best to go in sort of blind but just briefly; Middlesex tells the story of Calliope Stephanides and three generations of the Stephanides family from 1920s Greece through the 1967 Detroit race riots and to the modern day. It is an epic about family, love, loss, growing up and a long-buried family secret that unearths revelations about Calliope's genetic history. In short it's amazing and has quickly become one of my favourite books ever. Middlesex is incredibly atmospheric and beautifully written, it really immerses the reader in the eras it travels through. I felt such a strong connection to this story and definitely want to re-read it again in the future as it's such a rich narrative I feel there will be something I've missed. Please read this book if you haven't already! This was my classic pick for the month and I'll be reviewing it for the 2015 Classics Challenge so won't go into it too much here. Sense and Sensibility follows two sisters, Elinor and Marianne, who, as the title suggests, are complete opposites. I didn't enjoy this as much as Persuasion but it was still brilliant. I wasn't really expecting much from it as the blurb didn't really pull me in but I actually found it really enjoyable and kept thinking about the story after I'd put it down. I found the concept really interesting and it was quite refreshing as I've not really read a lot of paranormal before. I'll definitely be continuing with this series. This is the third book in The Land of Stories series so I can't really say too much about it because of spoilers. I've always enjoyed this series, the idea behind it is really fun and interesting and it's just a really enjoyable light read. I'm looking forward to reading the next one which has already been released. This was my third and last read of TBR Takedown and it's the book that the tv show Dexter is based on. Dexter is one of my favourite tv shows so I picked this up a very long time ago to see if I liked the books better. It's safe to say that it definitely works better as a tv show. The book is written like a tv show, it's very visual and sounds like a voiceover a lot of the time. I kind of wanted to rate this higher because I do really love the show so I therefore love the characters and the plot but it just wasn't written particularly well and felt very rushed in parts. The characters in the book were a bit two dimensional and needed to be fleshed out more, I was very familiar with the characters because of the tv show so I was able to fill in the blanks a bit but it still bothered me. I did have quite a few problems with the book and think that I only really enjoyed it because it felt nostalgic to revisit the story but I won't be continuing with the book series. 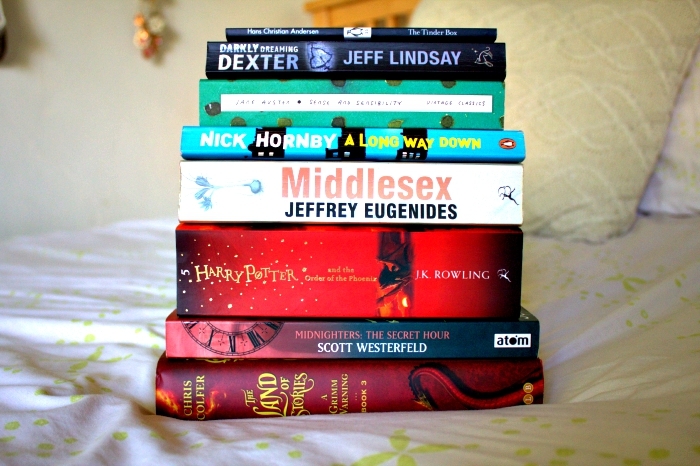 So that's everything I read in July! I'm hoping to have a just as successful reading month in August and I'll be posting my TBR on Wednesday so look out for that.